The following highlight was submitted by Eritrea Ande, a 2018 Linn-Mar graduate. Since his freshman year, Kevin has been incredibly involved at school. He joined just about every club and musical activity. Kevin quickly exhibited leadership in his extracurriculars. He soon became a leadership officer in Key Club and the dance marathon executive chair. He also became super involved in student council and now serves as Class President. Additionally, he has co-chaired the suicide prevention committee, served on the FBLA Officer team, performed in the spring musical, participated in all-state music, student advisory council, and founded Linn-Mar’s HOSA-Future Health Professionals club. Kevin is involved in band, marching band, choir and show choir. Last year, Kevin organized the town hall meeting at Linn-Mar with 13 lawmakers and Parkland, Florida students. He served on the school board safety and security committee. 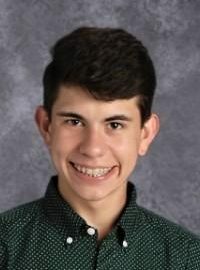 Outside of school, Kevin runs the 501(c)(3) nonprofit March For Our Lives Iowa and he is one of the first Linn-Mar students to serve as a legislative page at the State Capitol. Kevin also serves as an appointed youth on the State of a Iowa Youth Advisory Council where he has had a proclamation signed by the governor, introduced several bills into the legislature, and received the Governor’s Volunteer Award. Kevin was recently named a finalist for the United States Senate Youth Program and was a keynote speaker at the annual Iowa Student Learning Institute RISE conference. At school, Kevin has consistently taken AP and dual credit classes always pushing himself to be the best learner possible. During the summer, Kevin is a camp counselor and attends the Conference on National Affairs. Kevin has made the biggest impact out of anyone I know in this school district and he has continued to be an outstanding friend, advocate, and leader within the community. I saw this opportunity and knew I had to nominate Kevin Drahos for his outstanding work. Linn-Mar Congratulates Kevin Drahos as the February “Highlight”!